H: 18 cm (7,1″), W: 46 cm (18,1″). 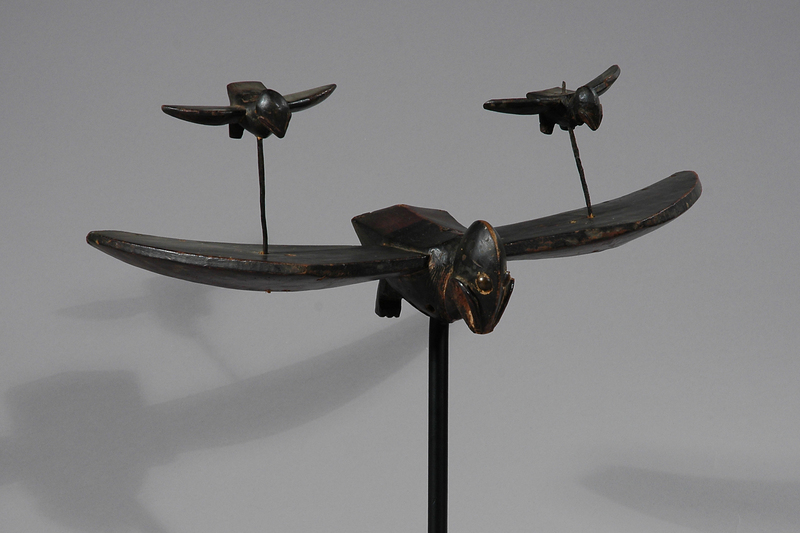 This Senufo “Sejen” bird staff finial has been collected in the 1960th by a Danish collector and is authentic with significant signs of use and age. 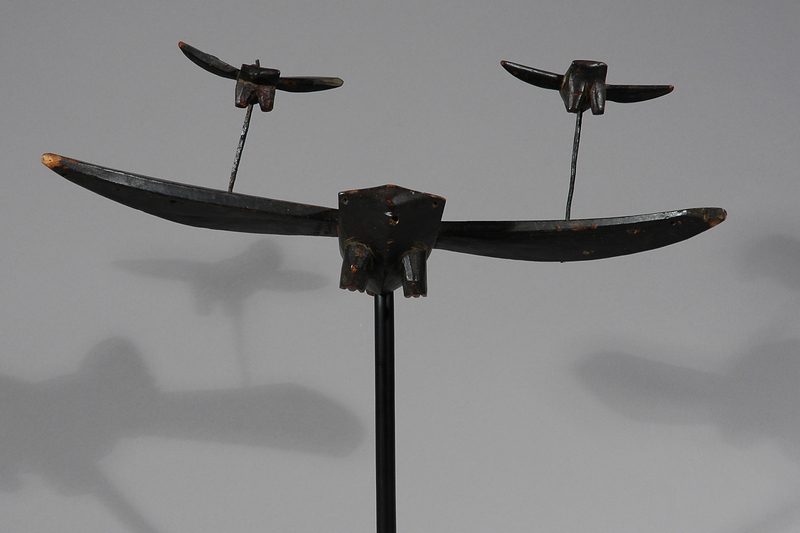 Single, double or triple birds were used in hoe competitions and were displayed on high staffs to show the importance of the harvest. The young men, under time pressure, would set up a yam or cotton fields with hoes. 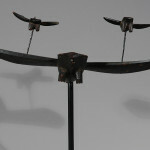 The birds on posts were also used as a sign of respect during funerals. 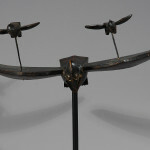 The original staff is lost; the birds are now displayed on a metal stand. 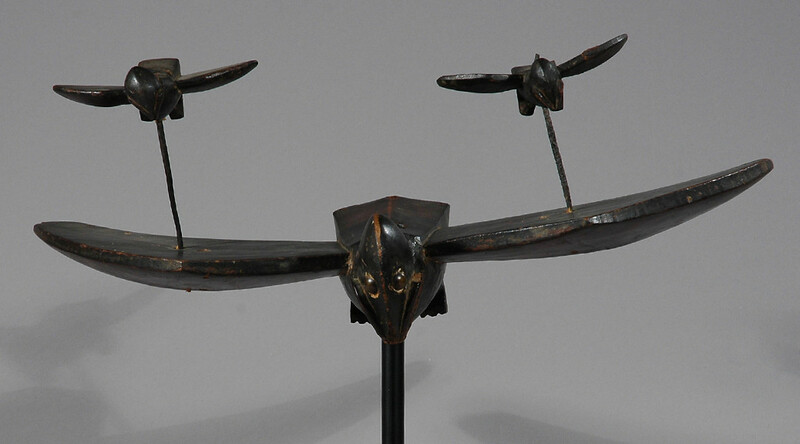 The Senufo people inhabit northern Ivory Coast and Mali and are known as excellent farmers, and are mainly a farming society. They live by a strict caste system, where the farmer is at the top and the musicians are at the bottom, everyone else filling in between. 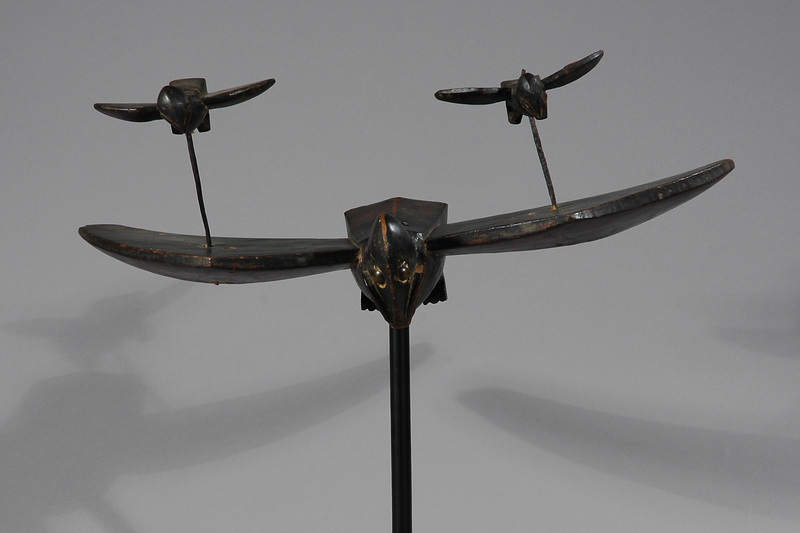 One of the highest possible honors given in the Senufo culture is the sambali (champion cultivator), who is respected throughout the region and in his old age is typically given a strong leadership role. Even for those who do not belong to the farmer caste, farming is huge in the Senefou culture. 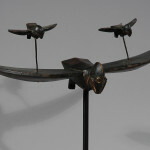 The society is very community centered; people often take turns working each other’s lands, trading off and on. There is usually a group in each village made up of men from ages 15 to 35, who are responsible for working in the fields and providing a huge festival during the dry season. To make farming and chores fun, local games are held to see how fast a man can hoe a field. Another society for men is the poro, or school for young men, usually located within the forest. For Senufo women, the greatest ability is the ability to cook well; if a woman or girl cannot, it is a shame to the family. The women’s society, sandogo, is responsible, mainly for divination.